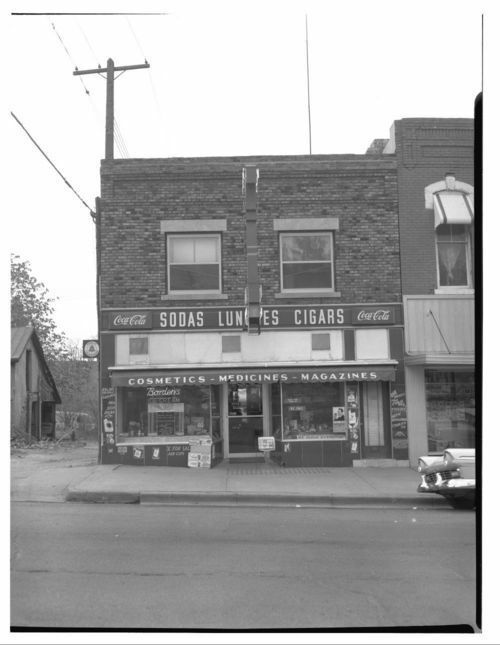 These photographs show views of Lytle's Drug Store on East 4th between Quincy Street and Kansas Avenue in Topeka, Kansas. The store was in the area of Topeka that was designated for urban renewal projects. The owner is identified as Charles Lytle, an African-American who had a career as a policeman and as deputy state fire marshal before purchasing the drug store. Charles Lytle also owned two barber shops in Topeka. (His sister was Lutie Lytle, famous as one of the first African-American women lawyers in the nation.) The first photograph shows an exterior view of the store. Signs advertise sodas, lunches, cigars, cosmetics, medicines, magazines, Coca-Cola, and Borden's Ice Cream. A sign along the bottom of the window to the right of the door reads, "Come in, sit down in comfort, we serve everybody." This may be a reference to racial segregation and civil rights issues affecting society at that time. Other small signs on the outside of the building advertise photographic film for sale and developed, cigarettes, and cosmetics. The second photograph shows an interior view of the drug store. A soda fountain and service counter is visible, and several signs on the wall behind the counter advertise food and drinks available, including signs for Coca-Cola and Borden's Ice Cream. A row of display cabinets and shelves is visible on the left side of the picture. Other signs in the background advertise Chesterfield Cigarettes.